With a house on the northern slope of a hill, I need to pressure wash my siding and decks annually. Of course, I haven't actually done this in five years, so I have plenty of pressure washing to do. Rather than rent a washer for several days, I decided to buy one. It only took a little research to decide that I should buy a gas-powered model instead of electric, as even the smallest gas models are more powerful than the typical electric washer. http://www.pressurewashersdirect.com/ has a lot of good buying information, but their recommended models are frequently sold out. The cheapest recommended models are in the $250-$300 price range, and use either Honda or Briggs & Stratton engines. 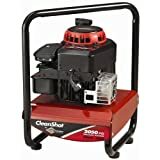 Out of pure luck I stumbled upon a Briggs and Stratton 2050 PSI Clean Shot Pressure Washer on amazon.com for $199, with an instant $25-off coupon. For $175, that is an excellent deal for a gas-powered pressure washer, so I bought it. At 2050 PSI plus 2.0 GPM water flow, you can send a stream of water so powerful that it will cut a piece of weathered 1×4 redwood clean in two (as I almost did). You need to dial back the sprayer to make sure it won't destroy the wood. Sturdy shoes, long pants, earplugs, eye goggles, and a dust mask are mandatory when using this thing. So far, I've used the Briggs washer to blast away several years of gray mildew and weathering from a 265 sq/ft deck. Not including the time to remove everything from the deck and spray down some Superdeck no-bleach cleaning solution, the whole pressure washing process took me about two and a half hours plus about a half gallon of gas. Not bad at all, and now the deck has a natural wood finish that is (almost) ready for some new stain. In the future, I'll consider buying a more powerful washer so I can clean the decks with a wider spray setting, but for now, this is a perfect budget pressure washer.